Today, there are social networks for just about anything. 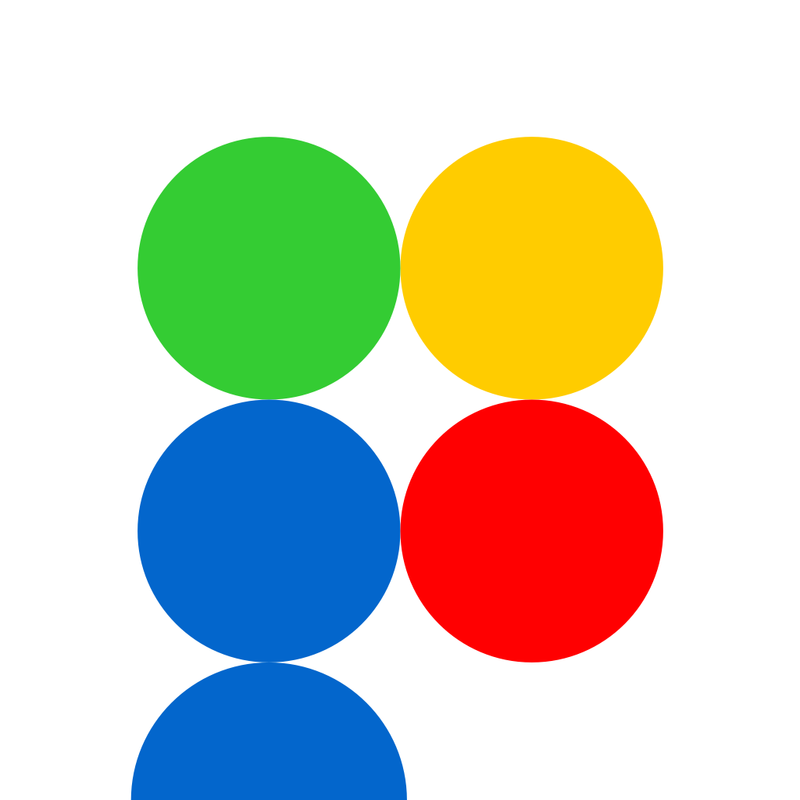 Now, to add to the ever-growing list of social networks, I'd like to present Puzzlium (Free) by Puzzlium, Inc., the first puzzle social network. 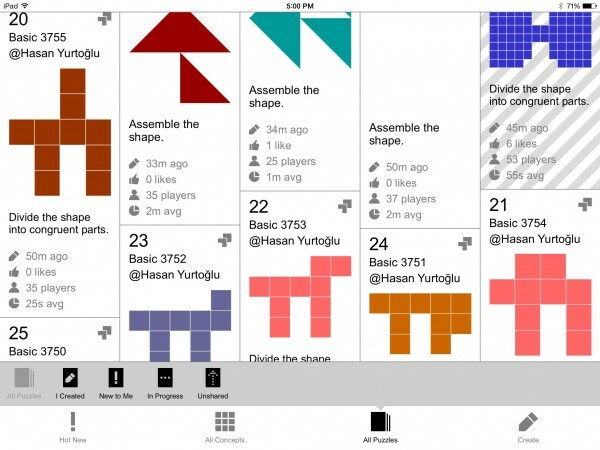 Brought to life months after Puzzlium's Prologue, this app contains many similar puzzles, but by taking puzzles to a social level, Puzzlium makes constructing and completing puzzles a shareable experience. 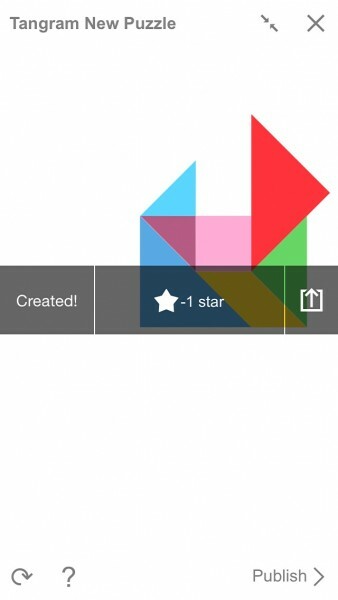 The main view in the app consists of a feed, like any social network would. Here, puzzles created by users are displayed by what's Hot Now, Top Played, Most Liked, Easy, or Hard. Tapping on any puzzle will challenge you to complete it, which will be timed for ranking against others. 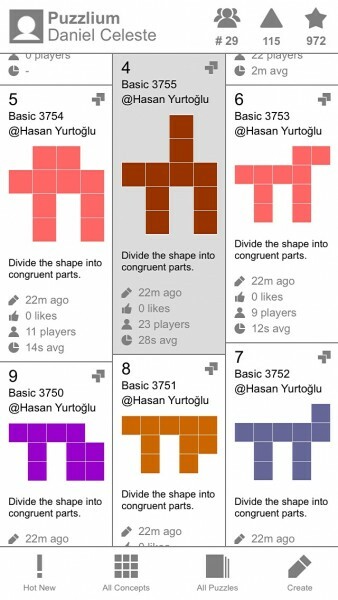 Puzzles include types involving Tangram, Cutting By Painting, and Tetromino. 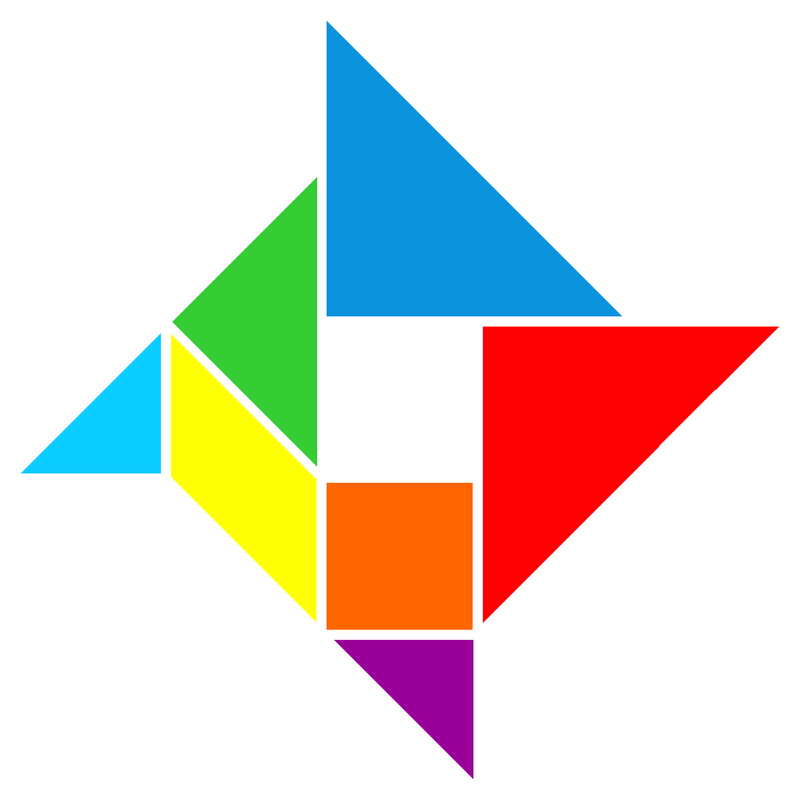 Tangram puzzles involve assembling tans into certain patterns, using the same seven tans each time. Along with this, the Cut By Painting puzzles involve dividing a shape up into equal and/or congruent sections by painting them different colors. 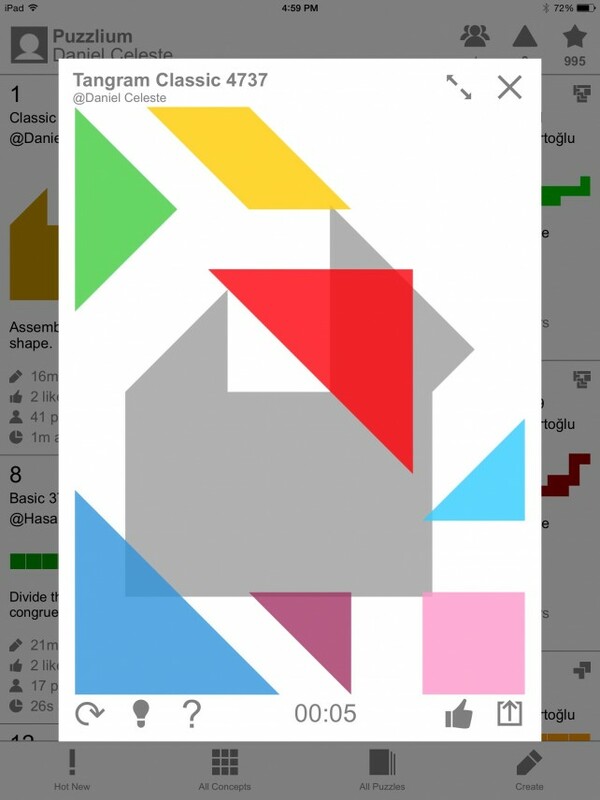 Finally, similar to the Tangram puzzles, Tetromino puzzles are those that are to be filled by using a given set of tetromino shapes, although they are not of the tangram variety. While the @Puzzlium Team account on the Puzzlium network has made some puzzles to start with, the intent of the social network is to have users create and complete each other's puzzles. 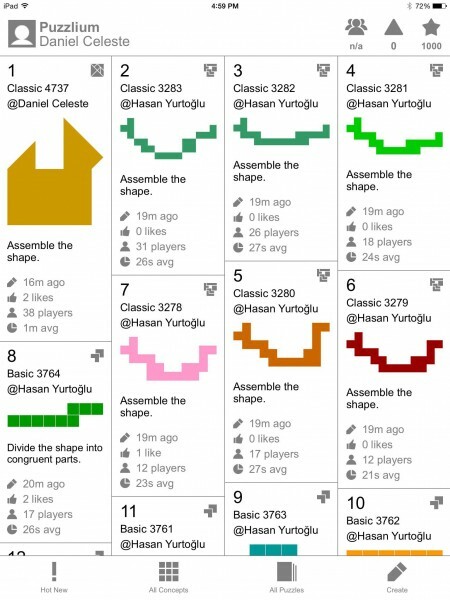 Creating puzzles is dead simple using the built-in editor, and they can be shared with specific friends using a URL that will open them right in the Puzzlium app, which I think is really cool and extremely thoughtful on the developer's part. 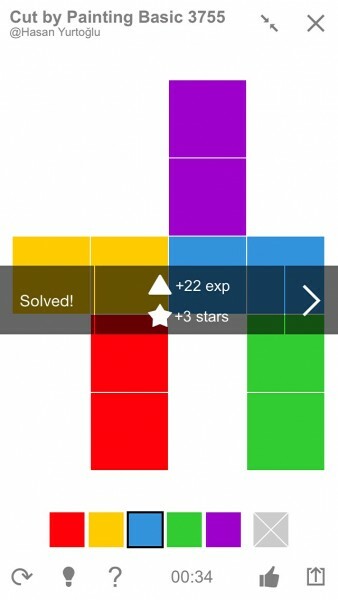 Although the puzzles are not quite as sophisticated or varying as they are in Puzzlium: Prologue, the Puzzlium social network is still a worthy creation. 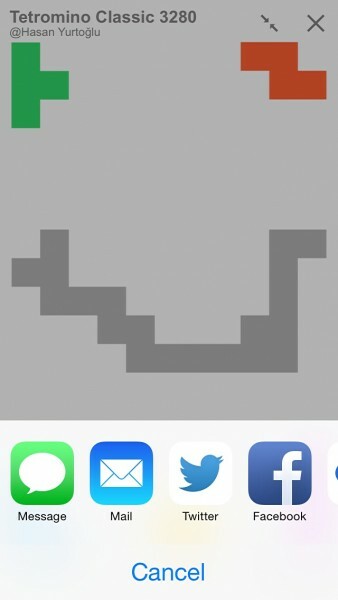 The idea of a near-endless variety of puzzles that can be shared with anyone should satisfy puzzle fanatics, and the fact that the app is mostly free will also make it accessible. However, do keep in mind that stars are required to begin an publish puzzles, and extras are available via in-app purchasing despite being easily acquirable through frequent playing. You can find the universal Puzzlium on the App Store for free.